Jimmy Floyd Hasselbaink admits he is facing a catch-22 situation as he tries to get the Cobblers back to winning ways. After last weekend’s 5-1 drubbing at Oldham Athletic, the Town boss knows he has to tighten things up defensively ahead of the visit of Walsall to Sixfields on Saturday. But he knows that doing that runs the risk of further weakening the team’s attacking options. And when you’re in charge of a team that has scored just once in the past six-and-a-half matches, that is not really a viable option. So what can the manager do about it? “We are a little bit too fragile at times, and I need to help them more, to get that out of us,” said Hasselbaink. “We need to find a way to be a little more solid, but by being more solid, you take more away from the attacking side. “And the attacking side needs more, because we want to create more chances! Town go into the clash with Saddlers still licking their wounds from their Boundary Park beating, but Hasselbaink insists he there were signs of encouragement, especially in the second half. He said: “We need to bounce back, but the thing is (at Oldham) what can you do? “You are losing 3-0, so do you sit back? Do you try to keep it to 3-0, or do you have a go and try to score goals? That is what we did. “If you do that then there is always the chance a few other goals might go in, or we might nick a few goals, but unfortunately we couldn’t manage that and Oldham scored two later goals. 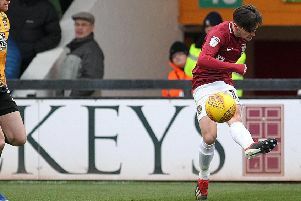 Saturday’s game is the first of two in a row at home, with Blackburn Rovers coming to Northampton a week later, and Hasselbaink is expecting a difficult afternoon against a team that has won their past three league games. “Walsall have a lot of energy, they play 4-1-4-1, and they are very well organised and have pace down the sides,” said the Cobblers boss. “They like to play together, they have a young and energetic squad and they try to suffocate teams with their energy. The Town manager knows these two home games offer his team the chance to get back on track, but he is wary of the challenges ahead. “Walsall are a team that has been in this league for some time, and we are in our second season, and then we are playing Blackburn,” he said. Hasselbaink is waiting to discover if goalkeeper Matt Ingram will recover from a shoulder strain to take his place in the team against Walsall, while he is also hoping Daniel Powell will be available after five weeks out with a hamstring strain. Sam Hoskins is a doubt after rolling his ankle in training last week, Shaun McWilliams is out as he is suffering from growing pains, while John-Joe O’Toole will play through the pain of a bruised ankle bone to take his place in midfield.